The coat is very nicely done, but I can't help but notice that the Archbishop has changed his personal arms from the time he was Bishop of Orlando and now. The charges on the chief have been changed from six-pointed mullets to fleurs-de-lys. 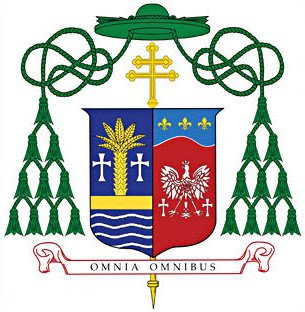 According to the article, the fleurs were taken from the one on the chief in the arms of the Diocese of Orlando. It does not explain where the earlier mullets (used when he was Bishop of Orlando) came from. It's great to see heraldry not only being used in the United States today, but also the personal meaning of the charges on the arms being discussed.